The rest stroke, also known as apoyando, produces a full and powerful sound, and differs from the free stroke in its follow through. Whereas the free stroke moves the finger through the air, clearing the adjacent string, the rest stroke moves through the string and then rests on the adjacent string. For beginners, the rest stroke is easier to use because it restricts the movement of the follow through. Its almost like the adjacent string catches the finger like a net. The great thing about the rest stroke is that it forces the player to push the string towards the soundboard, thereby creating a strong, full sound. So when beginners try both the rest stroke and the free stroke they are more likely to get a good sound from the rest stroke first. Where the rest stroke really shines is with melodies. A common texture on the classical guitar will have a bass voice, an inner voice perhaps with some chord notes, and a melody. By using a rest stroke on the melody, it will give it the volume it needs to sing out over the other notes being played, creating an effective balance. 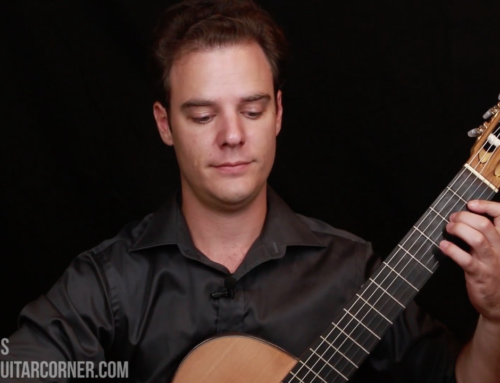 Using a mixture of rest and free strokes in the right hand can take some time, but it is very useful, especially in romantic music such as Tarrega or Llobet. In a similar way the rest stroke can be used for accented notes. The downside of resting on the adjacent string is that it will stop it sounding. So, if there was a chord ringing on other strings, the rest stroke will stop one of those notes. In the end, both strokes are tools to be used. Some players will gravitate to one or the other, but as a painter has her brush strokes, we have ours. The rest stroke is covered in depth as part of the Level 1 Technique & Musicianship Course in our membership packages!